AUSTIN — The Texas Community Music Festival continued Sunday, April 25, under blue skies at Central Market North. Traditionally, the Sunday morning set is performed by the Chaparral Dixielanders, and for the fifth consecutive year, the Austin jazz band kicked things off. Lisa Clark made the first of several Sunday performances, followed by the Starlight Symphony Orchestra and Hill Country Community Band of Wimberley. The afternoon portion of the festival swings into jazz mode, beginning with the Austin Jazz Band, Lisa Clark’s Swingin’ Caravan, Republic of Texas Jazz Band, ACC Jazz Band and culminating at 7:45pm with the Austin Jazz Workshop. 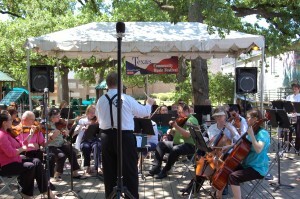 Check back for updates, photos, videos and other news from the 2010 Texas Community Music Festival.